I will now be posting a monthly White Dwarf review as a regular feature on Chicago Dice. I’ll highlight each of the main features from the issue along with a few photos. I’d like to keep these as a running log of the new (current) version of White Dwarf and how it fares month to month. 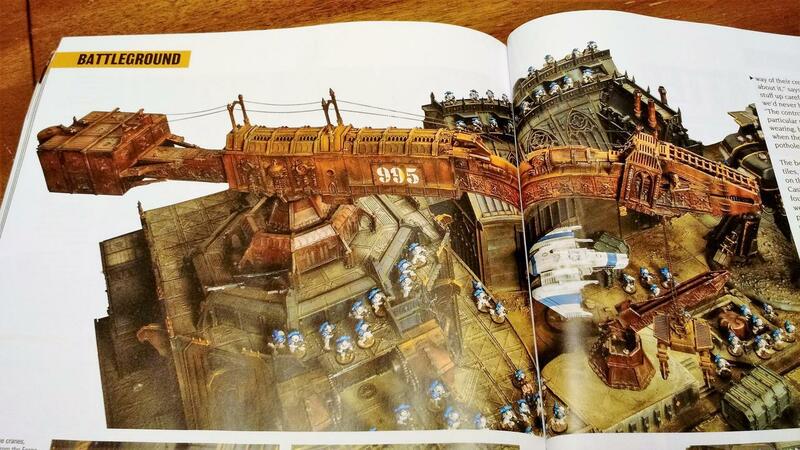 Let’s take a look at the fourth installment of Games Workshop’s monthly hobby magazine. The December issue weighs in at 148 pages, the same as the first issue back in September. I have no issue with the page count as this magazine is loaded with content. 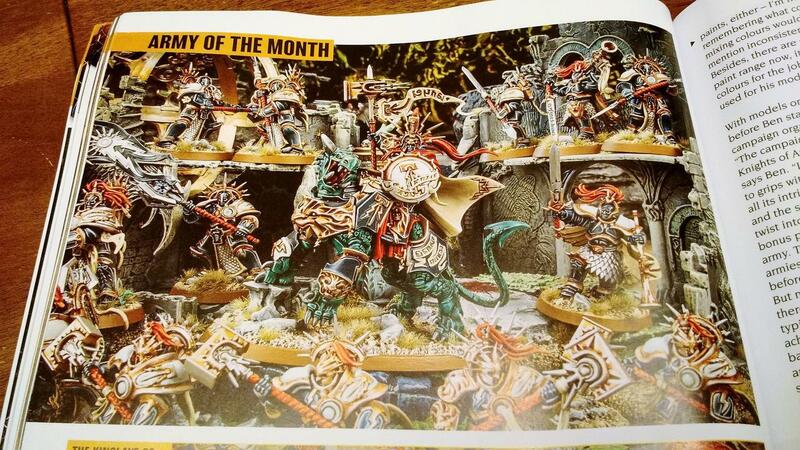 Each issue of White Dwarf starts with a round-up of the months releases in Planet Warhammer. This 21-page section covers everything from the new release of Blood Bowl, the Thousand Sons, new Black Library novels, video games and more. 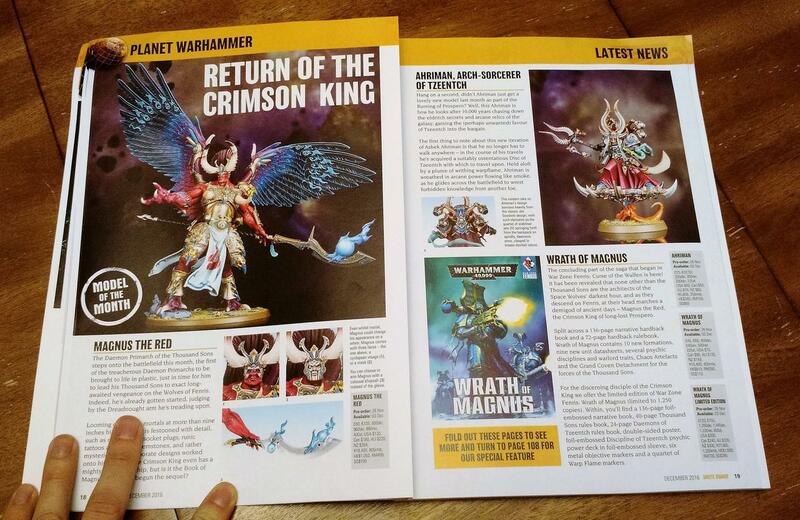 It is great to see third-party releases included in White Dwarf and it’s great to see all aspects of Games Workshop being highlighted beyond just the models. Plus, there is an incredible four-page spread of Magnus the Red and the Thousand Sons battling a horde of Space Wolves. I also want to highlight part of the description of Magnus as “the first of the treacherous Daemon Primarchs to be brought to life in plastic”. Now, I do not want to start any rumors but that wording certainly leaves it open for more Primarchs! One of the upcoming releases that I am most looking forward to is Index Chaotica and Index Imperialis. These two hardback volumes are a follow-up to the excellent Index Astartes and are a must have for collectors like myself. For anyone not interested in the Thousand Sons, this month’s big release is Blood Bowl. The only surprising thing about this release is that it took Games Workshop so long to come out with a new edition. Blood Bowl has been a fan favorite for decades and the new edition is sure to impress. If you are interested at all in Blood Bowl the 10-page cover story, plus the Match Report, should provide you with all the details you need. For $99, a fair price, you get the wonderfully reimagined Blood Bowl filled with two complete teams in gorgeous plastic along with all the dice, counters, cards and even a double-sided game board. If you are put off by the $99 price tag, have no fear! The Skaven team is also available for order and for just $35 you can get a full team. This is a great sign for future Blood Bowl releases and for us who have a friend that picks up the full game and we only need to grab a team. Now here is a first. An installment of Blanchitsu that I enjoyed! 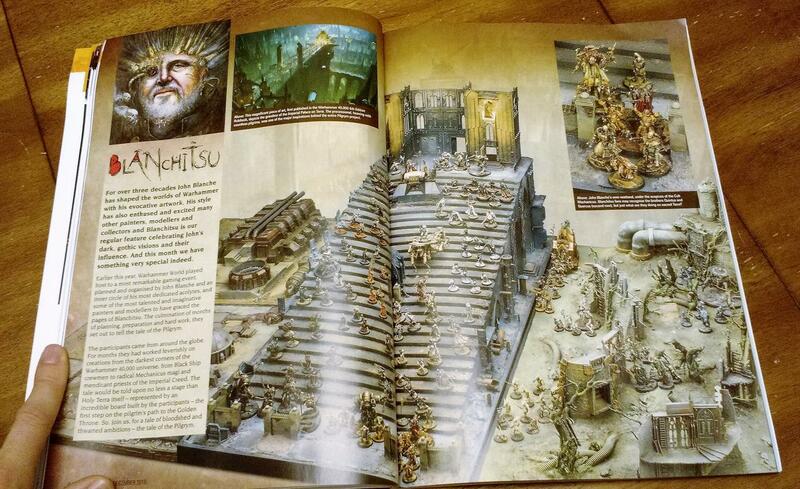 Normally I am not a fan of how John Blanche’s iconic art style is translated onto the tabletop but not this month. Instead of a short showcase of a warband or a collection of models, this month takes a look at an event that took place at Warhammer World and involved a dozen players all with warbands on a set on incredible custom tables. I never thought I’d say this but, I wish this section was longer. We are now in month four and this short installment focuses on a hero that each player was required to add to their army. In this quick showcase we see Drycha, a Maggoth Lord, a Mortarch and a Megaboss. Next month will see a full report on games played during a ladder campaign. I have enjoyed reader this article each month and do hope White Dwarf keeps it going with another group once this campaign has ended. The Army of the Month for December is truly something else. Typically, Army of the Month showcases a collection of miniatures that has been in the works for years. Not so this time. Ben Johnson’s Stormcast Eternal’s army is just over a year old and it is nothing short of amazing. The sheer amount of models, especially the five Stardrakes, is mind bending. How Ben had time to paint all of this, and to an excellent standard, in such a short amount of time is both inspiring and intimidating. Taking the place of the monthly Battle Report is a Blood Bowl Match Report. My one complaint on the White Dwarf Battle Reports is that they are often difficult to follow and the tactical write-up that I am looking for takes on a narrative spin and it becomes a story as opposed to a detailed account of a game of Warhammer. Luckily, this Match Report goes blow-by-blow for a full game of Blood Bowl and includes easy to follow diagrams for each player turn. 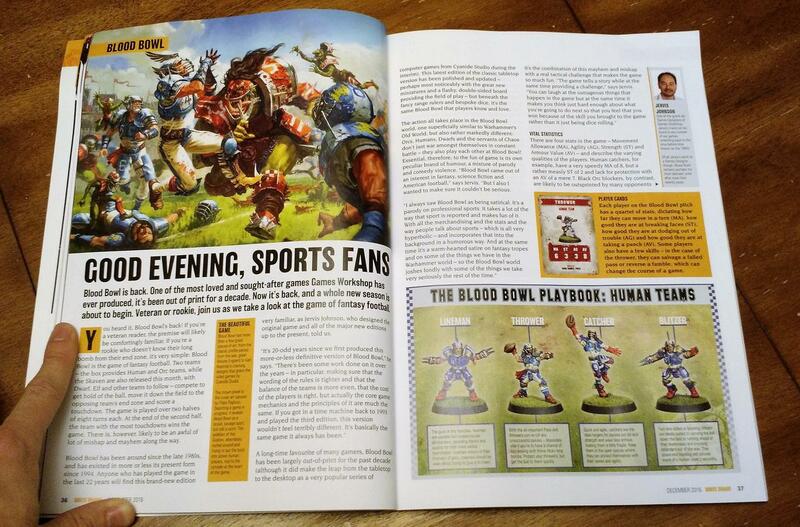 In the 11-page article I got a great sense of how this new edition of Blood Bowl is played along with highlights of all the action. A great improvement over previous Battle Reports. Another mainstay in this version of White Dwarf is Battleground and this month we look at a Horus Heresy table set as the Assault on Muster Tredecimma. This impressive display uses several of the Forge World Realm of Battle tiles including the Industrial Sector and the Imperialis Landing Pad. It’s an incredible display and it’s amazing that we get to see pictures of it but my earlier criticism stands, where are the WIP photos? This article has two whole pages dedicated to these massive custom built cranes and there is not a simple photo of either while they were being worked on. For example, “The two cranes use bits and parts from all across the Citadel and Forge World ranges, including some components that are now quite rare and difficult to get a hold of.” Show us! We hobbyits wants to see photos of these incredible creations while they are still in the works. The December issue of White Dwarf does not disappoint. It’s loaded with in-depth looks at the new releases and showcases some of the best work in the hobby. I didn’t even write about the great Golden Daemon Classic article, Paint Splatter or ‘Eavy Metal spotlight. There is a ton in this magazine and it is well worth the cover price. Sadly, one of my favorite articles, Illuminations, did not appear. I hope to see it return in January. I still want to see more work in progress photos from the Games Workshop studio, more concept art and talks from the designers and more insight into what is next. I understand that Games Workshop might not want readers to get a full look under the hood but some of the best and most inspiring work to share is the work still in progress. Be sure to check back in one month for the review of January’s issue.